Planning an alternate route from Glacier Point to Red’s Meadow was easy using Sierra Mapper. If you are like me, planning a backpacking trip is half the fun. I get an enormous amount of satisfaction from working out how far to walk each day, where to camp, and what side trips to take—whether they are a few hundred yards or a few miles. Once I’m on the trail I am more than willing to deviate from the plan for a good (or frivolous) reason, but I still show up at the trailhead with a plan, all the way out to the summit of Mount Whitney. If you like to plan, and if you don’t mind losing hours to the internet as you go crazy trying out different routing alternatives, you have to give Sierra Mapper a try. What a joy! Sierra Mapper is a mapping utility that works within your internet browser. No software, other than that browser, is necessary. Its operation could not be simpler. Adam White, the genius behind the app, has done all the tough work for you. When you first navigate to the website you are presented with a topographical map. To get to that map click first on the Sierra Mapper link and then on the link that says, “Go to the Alpha (Latest and greatest! )” on the top of the page that loads in your browser. In order to ensure you get the proper John Muir Trail, click on Happy Isles, one of the trailheads or intersections near Tuolumne Meadow, and then Red’s. Voilà! Now all you need do is click on “Calculate Route!” and let the utility do its thing. Soon you will have a map route and a terrain profile. ~ You can download your route as a .kml file. Why is this cool? Because you can then open the route in Google Earth and take advantage of all the neat features there. ~ The profile includes a chart for cumulative climbing and descending data. I find those useful when determining how far I should hike each day. ~ There is also a button that allows you to export your route to CalTopo, which is another great internet resource for hike planning. With the Donohue Pass quotas that the park service is imposing this year, lots of people are looking for alternate routes. I can think of no better place to try those out than at the Sierra Mapper. wow this is awesome. do you know if Mr. White is planning to expand to other parts of the Sierras? I’m thinking north towards the Tahoe area. Thanks for sharing!!! +1 for extending this to the Tahoe area! 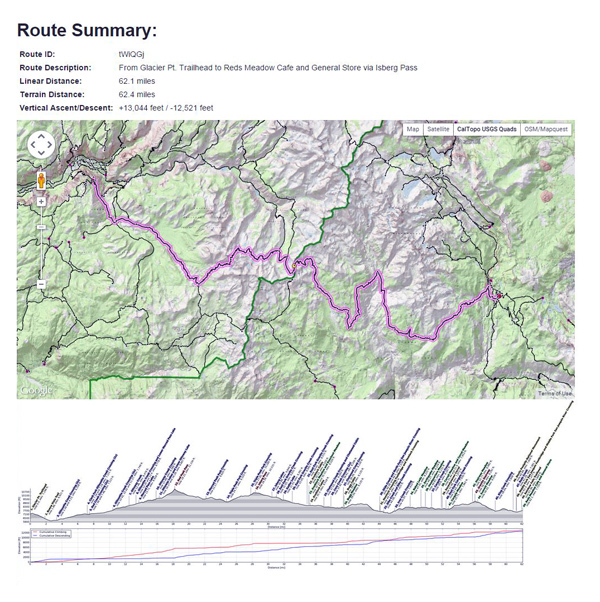 I’ve used Sierra mapper extensively, and I’d love to see any expansion of the trail coverage. Agreed! My wife and I own a home just east of Verdi and we would love to see an expansion. I really like this. I am doing my section hike next week and this is awesome. I can’t see how I missed this blog post. Thanks for the great heads up on this. Appreciate the kind words, Gary. Have fun on your hike! Love planning a backpacking trip as much as the trip itself (if not more!) Thanks for pointing Sierra Mapper! So in love with it. You’re right with the exit Donahue Pass quota that got implemented we’re looking at alternate routes to do the John Muir Trail. This is helping plan a NoBo. It’s a terrific tool, Oshie, and I couldn’t agree more about planning being great fun. Thanks for the comment! Just gave it a whirl and clearly did not have enough waypoints along the JMT. Things got a little crazy south of MTR. The route was calculated, but I got an error message stating ‘this is really bad’. As an ex-coder, I’ve been there. Looks like it does a great job if you give it enough to work with. Heading SOBO in August, pending lottery / walk up. Sorry it didn’t work out better, David. I’ve had good luck, but perhaps with fewer waypoints? Thanks for the comment. I think actually just needed more to keep the track along the JMT itself. I had none between MTR and Whitney. Pretty amazing that it pieced together a custom route all on its own. He knows what he’s doing. I had to laugh at the error message because it’s the kind of thing you do give yourself a reminder and intend to remove or update later.